When faced with wicked weather days after days, one of my favourite tricks to keep my spirit high - aside from sipping hot chocolate and trying on new face masks - is to prepare comforting soup. Now what if I were to tell you that I have discovered a way to make soup in just 10 minutes, yep! If your wish for 2015 is to eat healthier food, I might just have found something that will make it easier for you to prepare yummy meals: Meet The Boss from Breville. It might sound like another kitchen appliance. I hear you. But if you like kitchen gadgets, entertain quite a lot and enjoy wholesome cooking with fresh ingredients, this deluxe blender deserves a prime spot on your kitchen counter. I have been doing a lot of blending ever since I got this mighty machine. Every week, I make my own almond butter...in less than 4 minutes. I also make hummus, tried hollandaise sauce, Chimichurri sauce, pizza dough, pesto, almond flour, sorbet as well as silky smooth green smoothies. Every single recipe I have tried with The Boss is surprisingly creamier. The blade system can pulverise any combination of ingredients into very fine particles, which creates incomparably smooth textures. 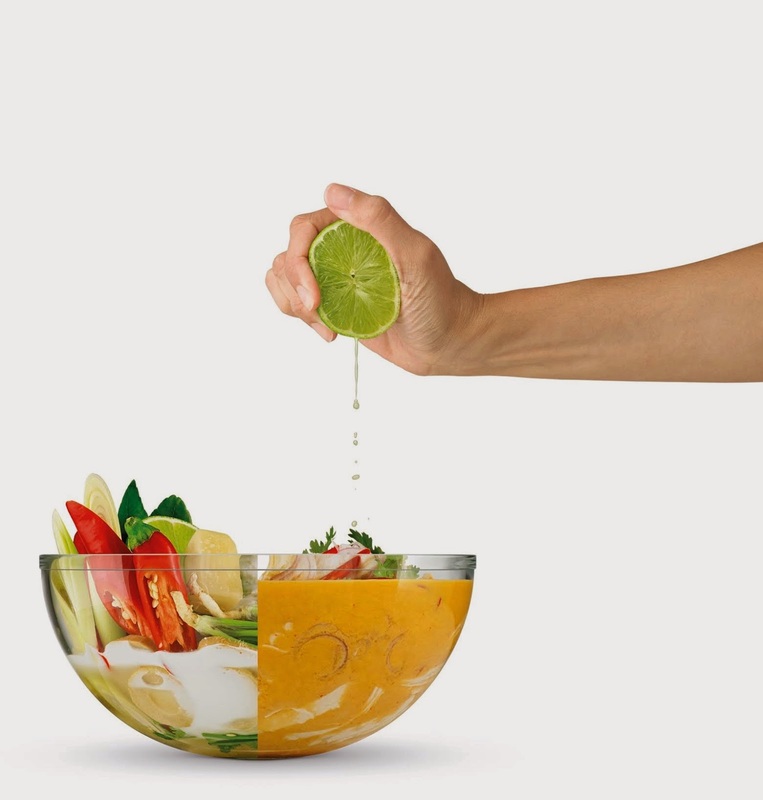 This powerful tool is not your average blender. And I haven't told you the coolest things about it yet...It turns ingredients into warm soup in about 6 minutes and it has an auto-cleaning mode. Once you are done blending, you just add a little amount of soap and water up to the middle of the jug and press "Auto Clean". It's simple as that. Now back to our recipe du jour. The Tom Kha Gai soup is a widely popular Thai recipe made with chicken, coconut milk and lemongrass. It is deliciously fragrant and spicy, just perfect to kill a cold. 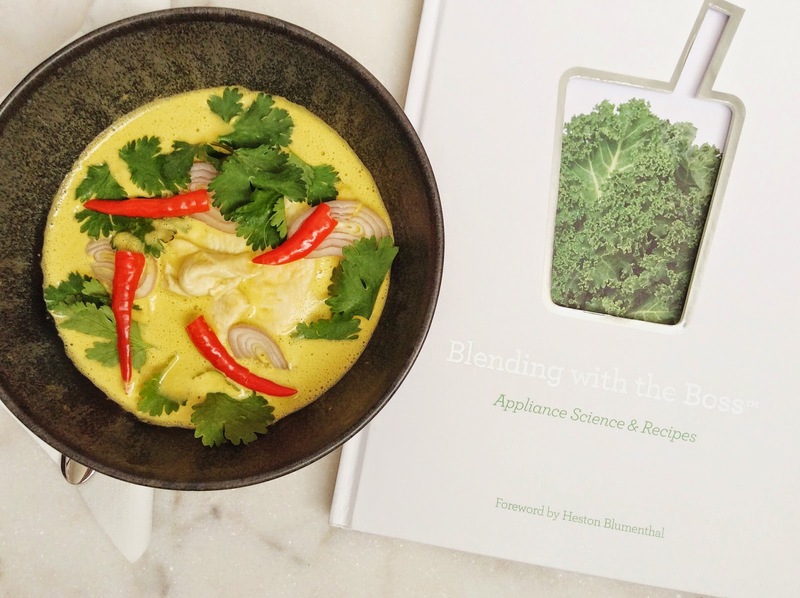 The classic recipe calls for galangal, an aromatic ingredients in the same family as ginger. It has a distinct flavour, which is key in this dish. You should easily find it at an Asian market, but if you don't, you can always use ginger instead. 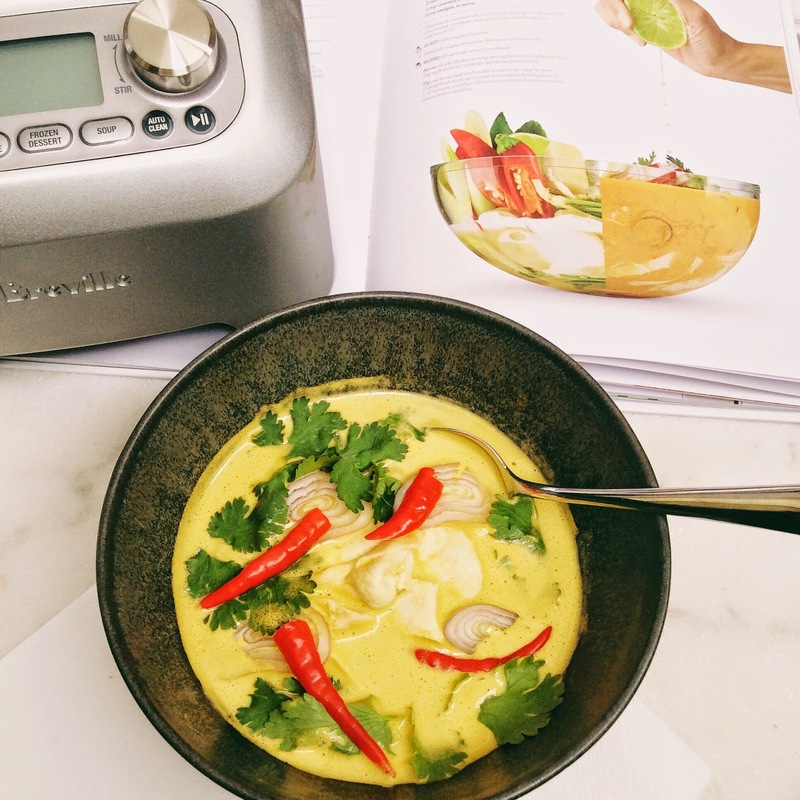 Ingredients: 2 cups (500ml) chicken stock, at room temperature 14oz (400ml) coconut milk 1 lemongrass stalk, pale section only, roughly chopped 1in (21/2cm) piece galangal or ginger, peeled and thinly sliced 4 kaffir lime leaves 5 coriander roots, scrubbed clean 2 long red chilies, seeds removed, plus 1 extra thinly sliced to garnish 1 tablespoon finely grated palm sugar (I used brown sugar) 2 tablespoon fresh lime juice 2 tablespoon fish sauce 2 cooked skinless chicken breasts fillets, shredded 2 red shallots, thinly sliced 1 cup coarsely chopped fresh coriander leavers Lime wedges, to serve 1. Place stock, coconut milk, lemongrass, ginger, kaffir lime leaves, coriander roots and chilies into blender jug and secure lid. Press SOUP until program finishes. 2. Add palm sugar, lime juice fish sauce and secure lid. Press BLEND 30 seconds or until combined. Serve: Divide chicken among serving bowls and ladle over soup. Top with shallots, coriander leaves and extra chilli. I have been making this soup every single week for the past few weeks. It's packed with flavours, quick to make and so heart-warming, especially in these freezing temperatures. I hope you'll try it too! Bon appétit! First image and recipe are a courtesy of Breville Canada. 2 comments on "Tom Kha Gai: The 10-Minute Soup "
You should! It' so delicious and just enough spicy.